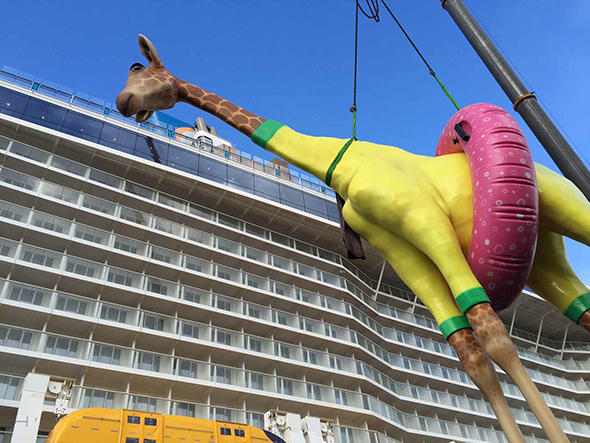 A 10-metre tall carbon fibre giraffe has been installed on deck 15 of Royal Caribbean’s newest ship, Anthem of the Seas. Weighing four tons and wearing a bright yellow swimsuit and pink buoy, the animal is the brainchild of French artist Jean-François Fourtou, who is renowned for depicting animals outside of their natural context. The giant animal follows the 30-foot magenta polar bear “From Afar” which is found on board sister ship, Quantum of the Seas. 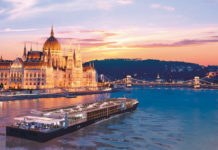 At a length of 348 metres, and with a capacity for 4,180 passengers Anthem of the Seas will be one of the world’s largest cruise ships when it is launched in 2016. 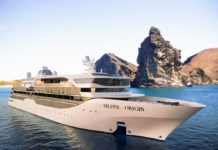 The ship’s activities at sea include the RipCord by iFly, the NorthStar Observation Pod and the largest sports and recreation area at sea, the SeaPlex.